As a business, you should be familiar with ways of optimizing your productivity. Part of this involves identifying things that could be done faster and more efficiently to boost productivity. One of those things is digital marketing. It takes time to establish an online presence and sustain it. Digital marketing is so demanding that for an organization to handle it on its own, it’ll need to have an entire department of experts to manage it. This may not be possible for most small businesses because these experts will be tough to find and pay. Outsourcing digital marketing is the best option for most businesses as illustrated below. Acquiring and maintaining a team of in-house digital marketing experts is expensive for most small businesses. This team will involve web designers and developers, SEO specialists, copyright experts, and alternative individuals who specialize in various web technologies. Rather than going through the pain of establishing such a team unnecessarily, it is best to outsource the task of digital marketing to an external agency that will provide all these services for you in no time and at an affordable price. Outsourcing digital marketing to an external agency will come with the benefit of providing your enterprise with all the experts you need. Most organizations are not inclined to digital marketing. Perhaps your business is about shoes, flowers, vases, or beauty products. Naturally, you’ll know a lot about your industry if it is about flowers but you only need a website for establishing an online presence. Having a website doesn’t necessarily mean that now you have to start learning all there is to know about the internet and its technologies. It would be a waste of valuable time and money. It’s easier, safer, and more efficient to get an external agency that will provide you with all the experts you need to fulfill your objective – establishing an effective online presence. Hiring a digital marketing agency to take care of all your digital marketing needs will enable your company to focus on its natural purpose. If you are selling shoes, you can focus on the shoes – their designs, colors, customer preferences, and even the discovery of new designs to either create or fulfill a need. In the background, the external agency will be handling everything that has to do with the marketing of your online business. This enables your company to be more efficient and productive because you’ll be making progress at a significant pace. It is natural to have a marketing department in your organization but its work should not necessarily have to involve all digital marketing needs. This department can oversee how the external agency is doing while it focuses on the internal marketing needs of the company. In the process, your internal marketing department may overlook some things as it is caught up with all the marketing needs of your organization. The external agency can provide some insights and new perspectives on how to approach your marketing as it works together with your internal marketing team. This will enable your business to approach marketing in general from new and different angles that may give it a competitive edge. Having an external organization handle your digital marketing needs will automatically keep your online presence updated with the current digital marketing strategies and web technologies. One of the biggest duties of digital marketing agencies is staying updated with the current online marketing trends because they understand that their survival depends on it. Hence, chances are that your website will always be up to speed with the current digital marketing standards and your organization won’t necessarily have to concern itself with this aspect. 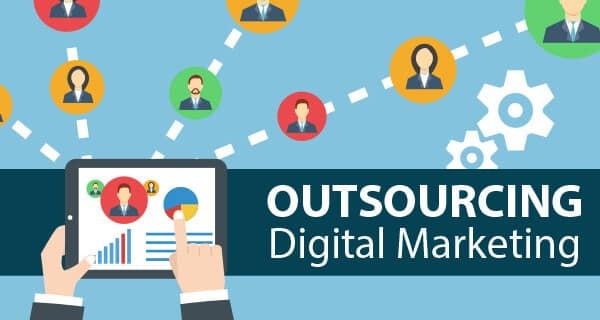 Outsourcing your digital marketing needs to an external organization will give your business room to grow, focus, and optimize its efficiency and productivity.